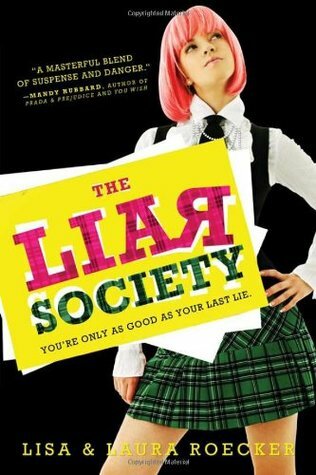 The Liar Society is a mystery book around a socially recluse girl looking to solve the death of her best friend, Grace. The main character, Kate, has become antisocial and detached herself from everyone around her. Instead, she prefers to relive the memories she made with Grace, leading to her parents sending her to therapy. She is told to let Grace go and start living her life happily. As she tries to listen to her therapists advice, she gets an email from Grace. Or at least so she thinks. The emails leave clues disguised as riddles which leads Kate on a mission to find out the truth about Grace's death. The answers aren't easy, and she later finds help from her redhead neighobr, Seth who has an obvious crush on Kate, and the cute boy who makes her feel something again, Liam. I enjoyed this book so much I stayed up until 6am to finish the whole thing in one night. I highly recommend this book to fans of Pretty Little Liars or anything similar. There was enough mystery to be suspenseful and engaging yet there was plenty of humor to balance out the overall depressing plot and chilling events. The book is written with several chapters of flashbacks so that readers can understand what happened during the past leading up to Grace's tragic death. It was really nice seeing Kate's character progressing throughout the book. In the beginning she was the reserved girl who didn't want to socialize with others. People around her looked at with pity which Kate hated even more. As events happen and Kate is fueled by the possibility of seeing Grace again, she becomes this strong and daring girl willing to do anything to understand Grace's death. You also see her opening up to others and actually feeling happy again. Her new friends are characters that I really enjoyed reading about too. Seth, her neighbor is the typical nerd who is oblivious to the bullying directed towards him. That's what I admire about him, he doesn't let anything hurtful affect him and lives life as himself. Not to mention he's dorky and a clueless at times which makes him oh so hilarious and the perfect sidekick to Kate. Together with Liam, the boy who you can't help rooting for to get together with Kate, they become her two knights in shining armor. As clues were given and pieces of the puzzle were put together, through every step of the way I enjoyed solving the mystery along with Kate. The plot turned into an unexpected twist which I really enjoyed and it suddenly became multiple problems that needed to be solved; how Grace, who was in on her death and why? The ending was something different too. Kate thinks she's solved Grace's death but then she is slammed right back to step 1. Nevertheless, in Kate's own thoughts, she knew that she had changed into a different and mature Kate, and the new Kate deserved a new start. I highly recommend this book to anyone who likes mystery, humor, and surprising events. I can't wait to read the second book to this trilogy.